Having trouble with client? Here's my Guide! First, I need to tell you, that if you have Windows 7, the client WILL NOT WORK! and i would post in the Downloads section but i can't. 1: You're gonna need WinRAR to access the client, Download WinRAR here Just pick the one for your computer. 5: When it's done, a WinRAR file should automatically open up, if it doesn't, your active downloads window should be up, and all you have to do is double click AGS-Scape Client. 6: Assuming you made it to the WinRAR file of AGS-Scape, you don't need to click anything in the files yet. You need to look near the top of WinRAR and click Wiizard, (its a big button with a wizard on it) and then click Finish. 7: Wait for it to finish. 8: After it finishes, a new Window should pop up. This is the Client Folder! YAY! 10: It automatically makes a new folder on your desktop called "AGS Scape Official Client". Open it. 11: Double Click "AGS Scape Official Client"
13: Now Double Click "Play AGS Scape". Wait a few moments and the client should open up! 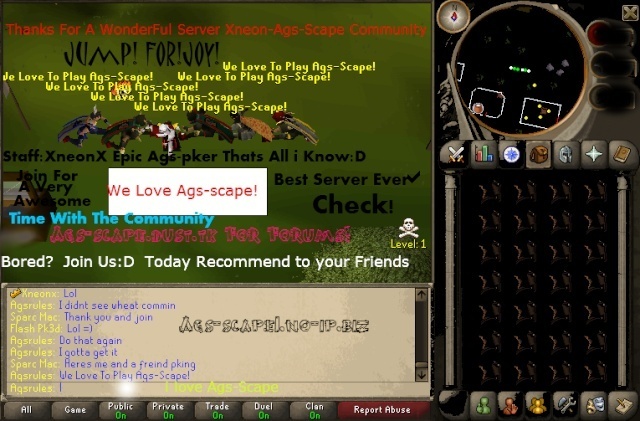 14: Just to tell you, DO NOT make "Play AGS Scape" a desktop icon because it will not work due to a lack of the client files and sprites etc... So you're just going to have to open the folder and click "Play AGS Scape" every time. Hope this helped any problems you may have had downloading the client! Re: Having trouble with client? Here's my Guide! Thanks for the guide Sparc. Maybe Xneon will add this thread to the moparscape/runelocus page, so that newbies can have help obtaining the official client. Lol I happened to be updating the forums as you posted. Added a new section "Away Section" and updated a few other things. Enjoy, doing whatever it is a sparc mac does. Ninja turtling?